Fathers and sons. You could fill a library with books about the paternal ties that bind — or fray: Sophocles' Oedipus Rex, Ivan Turgenev's Fathers and Sons, Philip Roth's Patrimony, Mario Puzo's The Godfather, and so on. And now there's Mark Sarvas' second novel, Memento Park. Dedicated to his father, who died in 2009, and his two grandfathers, who died decades earlier, it's an absorbing drama about a first generation Hungarian-American rooting around in his family's buried past in the hopes of fathoming his legacy. Sarvas made a name for himself with his sharp literary blog, The Elegant Variation, an early standout in the nascent world of online bookchat. Partly because of it, his first novel, Harry, Revised (2008), a quasi-slapstick dark comedy about a bumbling, narcissistic middle-aged radiologist's gauche plan to remake himself after his wife's death during cosmetic surgery, received tougher critical scrutiny than most first novels. 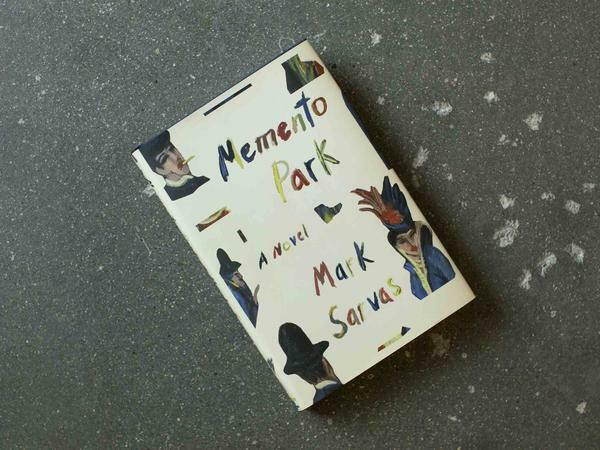 Although the narrator of Memento Park shares some of Harry's propensity for blundering behavior and self-criticism, this second novel is more polished and heartfelt. We meet Matt Santos, a gainfully employed 30-something C-movie actor based in Los Angeles, on the night he delivers the longest soliloquy of his career — an explanation of how he came into possession of the valuable Hungarian painting with which he is spending a last night before he relinquishes it to the auctioning block. It's a twist on the familiar narrative ploy of a Death Row confession, and his imagined audience is a guard sharing his nocturnal vigil at the venerable auction house. We learn within the first few pages that the fictional painting is Ervin Kálmán's 1925 masterpiece, Budapest Street Scene, which played a pivotal role in the Szantos family's traumatic wartime history. (The z, like the z in Szarvas, was dropped after they came to America.) Until it turned up with a paper trail that led to Matt's grandfather, Bela, it had been missing since 1944. In exchange for transit documents to get his Jewish family from Budapest to London, Bela had apparently sold it for a pittance to a member of Hungary's Arrow Cross, a fascist group that rounded up Jews in advance of Hitler's Nazis. But the documents did not arrive in time to save Matt's grandmother's life. During his long night's journey into day, Matt retraces his twisted path toward solving the mysteries that drive Memento Park: How the painting came into his grandfather's possession, and why his normally acquisitive father refused to have anything to do with getting it back and tried to wave Matt off its pursuit. With the help of Rachel Steinberg, an attractive, principled young lawyer from the World Jewish Congress, Matt investigates his "denied birthright" — religious, cultural, and material. Sarvas creates a compelling backstory about the fictional Jewish-Hungarian artist, who shot himself as the Nazis approached Budapest in 1944. He also captures the bad blood between Matt and his father, an obsessive collector of vintage toy cars who expressed perennial dissatisfaction with his lackadaisical only child, constantly exorting him to "Pushpushpush." The novel is drenched with Matt's soul-searching. "Why was I so incurious, so content to be ignorant for so long?" he asks after learning about his murdered forbears. He repeatedly casts doubt on his reliability as a witness, particularly regarding his father: "Is it possible that I have read him wrong my whole life, failed to give him the credit he deserved?" And he advises his imagined audience: "Trust the tale, not the teller." Voice is key in a monologue, and Sarvas' narrator does raise doubts. His long, self-lacerating monologue is filled with portentous hints about what's to come, including in his relationships with his stunning blonde fiancée, a swimsuit model, and his devout lawyer. The tone feels fusty for a thirty-something, and overly erudite for a mediocre student who quit college his freshman year, even taking into account his efforts to "plug up the potholes" of his "scattershot education." Fortunately, the ponderousness is offset by one captivating flareup after another — on a Hollywood set, at a desecrated Holocaust memorial on the banks of the Danube, at an awkward Sabbath dinner. A steady undercurrent of black humor provides a further boost. The title refers most directly to the "graveyard of Soviet-era statues" relegated to a park outside Budapest city limits where it finally dawns on Matt why his father had to flee his homeland in 1956. We come to recognize the inability of father and son to discuss their history — or, indeed, much of anything — as a compounding tragedy rooted in tragedy. Memento Park is ultimately about the mutability of memories and understanding, and an exhortation to really pay attention — while realizing how much you may miss regardless. As Sarvas' chastened narrator remarks, speaking about the painting but also about his many squandered relationships, "It's possible to spend an entire lifetime looking at something, and even then, to fail to behold it in any meaningful way."